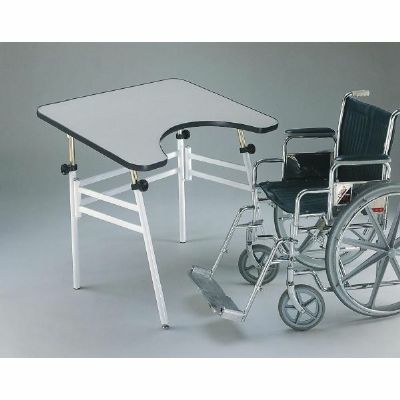 Alvin® Reflex Table Perfect in home or hospital for close-up work and wheelchair applications. The front of the Reflex Table is designed with a 1/2 circle radius cut out for easy accessibility, for close-up work and wheelchair application. The 30" x 40" top is constructed of scratch-resistant Melamine® and has a raised black PVC edge that prevents items from falling off the table surface. The base of the table is wide enough to allow wheelchairs to maneuver easily. Distance between legs is 28 3/4". Easy-grip knobs adjust telescoping legs to heights, 29" to 44", and angles, 0° to 45°. Perfect for home, hospital, nursing or rehabilitation center. Base and top shipped separately. Custom gray base available in quantities of 25 or more. NOTE: Base and top ship separately. Item does not include wheelchair.